'The capacity to affect and to be affected'. This simple definition opens a world of questions - by indicating an openness to the world. To affect and to be affected is to be in encounter, and to be in encounter is to have already ventured forth. Adventure: far from being enclosed in the interiority of a subject, affect concerns an immediate participation in the events of the world. It is about intensities of experience. What is politics made of, if not adventures of encounter? What are encounters, if not adventures of relation? The moment we begin to speak of affect, we are already venturing into the political dimension of relational encounter. This is the dimension of experience in-the-making. This is the level at which politics is emergent. 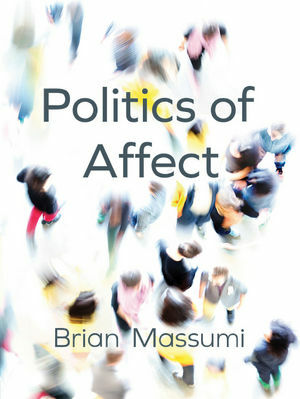 In these wide-ranging interviews, Brian Massumi explores this emergent politics of affect, weaving between philosophy, political theory and everyday life. The discussions wend their way 'transversally': passing between the tired oppositions which too often encumber thought, such as subject/object, body/mind and nature/culture. New concepts are gradually introduced to remap the complexity of relation and encounter for a politics of emergence: 'differential affective attunement', 'collective individuation', 'micropolitics', 'thinking-feeling', 'ontopower', 'immanent critique'. These concepts are not offered as definitive solutions. Rather, they are designed to move the inquiry still further, for an ongoing exploration of the political problems posed by affect. Politics of Affect offers an accessible entry-point into the work of one of the defining figures of the last quarter century, as well as opening up new avenues for philosophical reflection and political engagement. Brian Massumi is a political theorist, writer and philosopher, and Professor at the University of Montréal. "Brian Massumi wants to write a serious play of life by emphasizing the many different roles of affect. In these interviews, he sets out that project in compelling detail, adding yet more evidence that the enactive mapping of affect pays some remarkable conceptual dividends." "A politics of affect  what might that mean, given that we are completely immersed in affects? Spinoza and Deleuze have pressed us too forcefully into that particular sea. Massumi teaches us carefully how to swim in it. Not only a politics but also a practice of affect  a form of life."